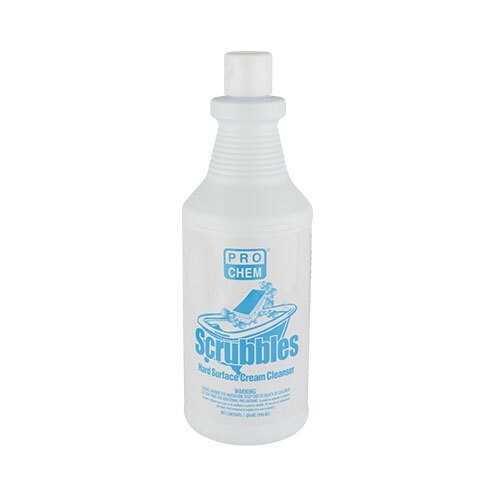 Scrubbles | Pro Chem, Inc.
SCRUBBLES is a cream cleanser for use on hard surfaces not harmed by mild abrasives, such as sinks, bathtubs, fiberglass bathtubs and shower enclosures, urinals, exterior toilet surfaces, drinking fountains, bathroom fixtures such as faucets and handles, glazed porcelain, metal, enamel, stainless steel, rubber, plastic, chrome, glazed ceramic tile and Formica. It has a pleasant mint fragrance and is excellent for removing rust, soap scum, stains, grease and hard water minerals. To clean and deodorize hard surfaces, squeeze directly on surface or on wet cloth, sponge or brush. Loosen soil with agitation. Rinse with water. For a bright shine, polish with soft dry cloth. On stainless steel, rub with grain. NOTE: Use only on surfaces not harmed by mild abrasives, such as porcelain, metal, enamel, stainless steel, pots and pans, urinals, rubber, plastic, sinks, bathtubs, chrome, drinking fountains, ceramic tile, Formica, fiberglass. Excellent for removing rust, soap scum, stains, grease and hard water minerals.